Daily Illuminator: Play The Munchkin Collectible Card Game And Get It Signed At ECCC! February 28, 2018: Play The Munchkin Collectible Card Game And Get It Signed At ECCC! Emerald City Comic Con opens this weekend in Seattle, March 1-4, and SJ Games will be there with your Munchkin Collectible Card Game fix! Our convention team of Rhea, Ariel, Guy, and myself will be camped out at booth 909, teaching the Munchkin Collectible Card Game to all of you fortunate con-goers. Not only will you get to play the game, we'll even have starter sets and booster packs to feed your newfound addiction at the show! As if that wasn't enough, some of our amazing Munchkin CCG artists will be on hand to sign your loot on Friday at 1:30 p.m., including Lar DeSouza (Orc Bard), Katie Cook (Elf Thief), Mike Luckas (Centaur Warrior), and Shane White (Halfling Ranger). Bring your Munchkin loot, or get some Munchkin CCG on site to sign. We'll also have Munchkin Jumbo d6 to give away for fans who share pictures from the convention using the hashtag #PlayMunchkinCCG and show us at the booth, so make sure you're sharing your selfies! And make sure you sign up for the Munchkin CCG draft on Sunday at 1 p.m. We'll have signups at the booth Sunday morning, and it will fill up fast, so sign up early! We'll also have our normal con swag, like Munchkin promo cards and bookmarks, so swing by and pick up a stack of loot! 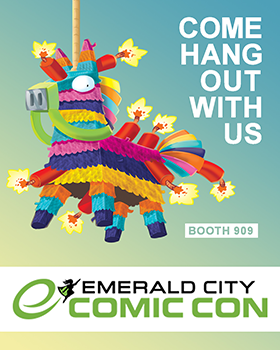 Come on out and enjoy the awesomely geeky ECCC with us, at booth 909!